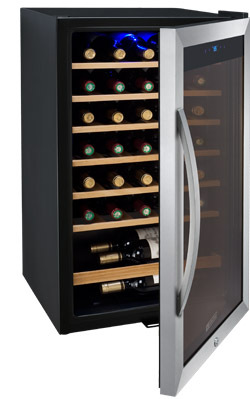 The Allavino Cascina Series CDWR34-1SWT Wine Refrigerator is a freestanding compact cellar that is capable of storing up to 34 wine bottles in optimal conditions. It's alluring design accompanies ultramodern performance for a combination that is sure to be the envy of your guests. The CDWR34-1SWT boasts 6 removable wooden shelves that can hold up to 5 bottles each, and includes a storage area at the bottom for an additional 4 bottles. Each of the shelves can be easily taken out and they extend effortlessly to easily load and unload your bottles. There is plenty of room in the bottom storage area for oversize bottles, so if you have some large bottles in your collection, they will have a place here. The temperature controls are conveniently mounted on the upper outside section of the stainless steel framed glass door. With an easy to see LED display, you can monitor and set your temperature in a snap without having to open the door and interrupt the cooling of your stored wine. Temperature can be set as low as 39°F or as high as 65°F, ensuring you'll find the setting that is right for your particular storage needs. The contents of the cabinet can be cast in cool blue light at the push of a button. Easily find the specific bottle you're looking for or leave the light on to elegantly display your collection and monitor when it's time to buy more wine! The sleek stainless steel framed glass door allows you to showcase your collection, while the UV tint on the glass keeps harmful light away. The door features a keyed lock to keep your collection secure and the curved handle is sturdy and attractive.